A whimsical theme to please all ages, circus cakes incorporate fun colors, shapes, and a delicious dessert all together. No matter your cake decorating skill level, there are exciting ways to play with the circus theme. Get ready to bake some cake, pipe some icing, and roll some fondant to make a playful circus cake. For a simple and fun cake, grab some pink- and white-frosted animal crackers from the store to make a cheerful cake filled with animal friends. This is a great cake for beginner decorators. Cut the domed tops of the cakes off so they are flat on top. Place one cake in the middle of a large plate. Cover the top of it in a layer of frosting and then place the second cake on top of it. Frost the entire cake with the offset spatula. Cover both the top and sides, as smooth as possible. Add a shell border to the top edge and to the base of the cake. Take the frosted animal crackers and add a small dot of icing to the back of each one and stick it to the side of the cake, right above the bottom border. Create a border of the animals in a line, all around the bottom border of the cake. Cut 20 small paper triangles (about 1.5" long). Lay 10 of the triangles face-down on a surface. Apply a small amount of glue along the top edge of the triangles. Lay the string across the row of triangles and then place the other 10 triangles on top of the string, adding more glue if necessary. After the glue dries, write your message. On one or both sides of the flag bunting, write a message or the birthday person's name, one letter on each flag. In the top of the cake, insert one bamboo skewer about 1" in from the outer edge. Insert the other skewer 1" in from the edge directly opposite from it. Tie one end of the string to each end of the skewers, letting it hang in a gently curved shape. 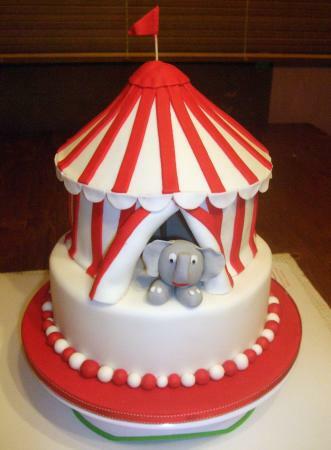 A circus tent cake is a visual treat! It has a fanciful shape and a bright color scheme that will bring joy to everyone looking at it. This cake involves some carving and a little bit of a steady hand with decorative frosting and so it is recommended for an intermediate level decorator. Turn any party into a real circus with this dessert. Cut the domed tops of the all of cakes off so they are flat on top. Place one 8-inch round cake layer on a plate. Cover the top of it in a layer of frosting and then place the second 8-inch cake layer on top of it. Dust your workspace with a little powdered sugar. Using the rolling pin, evenly roll out about half of one package of the fondant on your workspace until it is a large circle a little less than ¼-inch thin, using rolling pin spacers if desired. Use the rolling pin to pick up the fondant by laying it at one end of the circle and folding a small edge of the fondant circle over the pin, then rolling the fondant up by wrapping it around the pin. Move it over the base cake and carefully unroll it over top. Gently smooth the fondant over the cake, carefully pushing air bubbles down and out of it. It stretches slightly, but don't pull it! Just gently smooth it with your hands. Use a small knife to cut the extra away from the bottom of the cake - but don't cut so close that there's bare cake showing. Repeat steps 2-4 with the two 6-inch cakes, stacking them high. 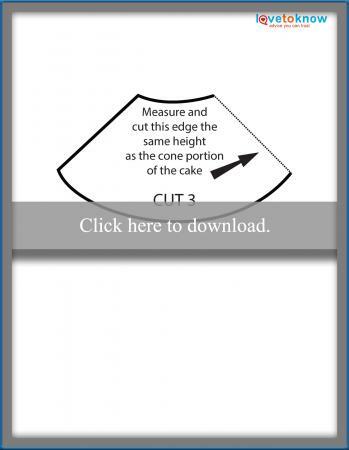 Using the serrated knife, carve small strips of the top 2 layers of cake (leave the shape of the bottom 2 layers as-is) away at a 45 degree angle to create the pointed top of the tent. It should come to a tall point at the center and be shaped like a cone. Dust your workspace with a little powdered sugar. Using the rolling pin, evenly roll out the other half of the first package of fondant on your workspace until it is a large rectangle a little less than ¼-inch thin. Cut three of the shapes indicated in the pattern below. Re-work and re-roll the scraps (adding more white fondant from the second package if needed) into a rectangle large enough to wrap around the bottom half of the 6-inch cake. Carefully lay the cone pieces on the top of the cake, lining up the seams. If there is extra fondant, cut it away. The seams can later be hidden under red stripes. Wrap the bottom half of the tent in the rectangular piece and where the seams would meet, sculpting it to look like tent fabric peeling open. This is where the elephant will later go. Roll out a small portion of the white fondant and cut 12 circles from it, then cut each in half. Set aside. Roll 15 spheres of white fondant, about ⅓-inch in size. Set aside. In a small bowl, mix about one quarter of the second fondant package with 1-2 drops of black icing dye and mix it with your hands until it is light grey. Dye the remaining fondant red in a small bowl with the red-red icing color, mixing with gloved hands until it is vibrant and evenly colored throughout. Sculpt the front half of the elephant from the grey fondant - its head, ears, and front legs. Use scraps of white and red fondant to make its face and toenails. Dust your workspace with a little powdered sugar. Using the rolling pin, evenly roll out the red fondant on your workspace until it is a large rectangle a little less than ¼-inch thin. Use the ruler and the wheel cutter to create approximately 40 stripes, the length of either the cone or the base of the tent's height. Also cut one 3-inch circle from the red. Place the stripes and stick them in place with a little buttercream frosting from the icing bag. Cut the excess of the stripes off at the top of the cone and hide where they all meet with the 3-inch red circle. Glue the white half-circles in place at the bottom of the cone using a little buttercream. Place the elephant at the tent's opening, gluing it down with a little buttercream if needed. Roll 15 approximately ⅓-inch spheres from the leftover red fondant. Place these and the white spheres, alternating colors, at the base of the 8-inch cake. Stick in place with buttercream if needed. Cut the red colored paper into two long triangles. Using a little glue, sandwich the two triangles around the toothpick to make a small flag. Place the flag at the top point of the cake. Clowns and circuses go hand-in-hand, so why not have them cavorting all over a beautiful layer cake? This is an advanced level cake design that involves tiered cakes as well as rolled and shaped fondant. The final product is colorful and eye-catching, just loaded with fun. Crumb coat each layer separately and on their size-matched cardboard rounds. 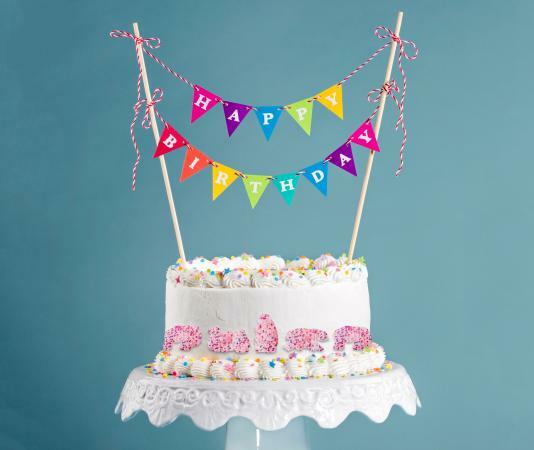 In the 8-inch cake and the 6-inch cake, place four dowel rods several inches in from the edge of the cake. Place them so that the layer being placed on top of them will hide the dowels. With several drops of the orange icing color, color one entire package of the fondant in a bowl. Wear gloves. Add the dye and fold the fondant over, working it in by hand until the color is evenly distributed. Dust your workspace with a little powdered sugar. Using the rolling pin, evenly roll out a little less than half of the fondant on your workspace until it is a large circle a little less than ¼-inch thin. If you desire, you can use rolling pin spacers to ensure even rolling. Carefully smooth the fondant over the cake. As you smooth, push air bubbles down and out of the fondant. It will stretch a bit but don't pull on the fondant. Use your hands to flatten and smooth the fondant. Repeat fondant steps 3-6 with the two other cake tiers. Divide the rest of the fondant into 6 bowls, leaving one white, and color the rest with Red-Red, Copper, Leaf Green, Golden Yellow, Royal Blue icing colors, using gloved hands to fold the dye in until it's evenly distributed. Cut an assortment of stars and circles of different sizes in yellow, red, and blue. Cut approximately 16 daisies. Sculpt four whimsical clowns in different poses to place on the cake. Use copper fondant for their heads, white for their mouths, eyes, and gloves, red for their noses, and a variety of colors for their clothing. Fondant can be molded by hand like clay and pieces that need to be attached to one another can be pressed into place or reinforced with some buttercream. Place the clowns on the cake and stick them in place with some buttercream icing. Use buttercream icing in a bag with a round tip to add a small dab of icing to the backs of the circles, stars, and daisies to attach to the cake. Sculpt several small cubes out of a variety of colors and use them to spell out the birthday person's name, one letter per box. The letters can be sculpted from fondant or piped on with icing. Top each present box with a little daisy, like a bow. If you wish, form small ¼-inch balls from the remaining colored fondant and place them in an alternating pattern, around the bottom edge of the 8-inch round cake. Keep an eye out for cake pans in the shapes of animals or clowns. These can be decorated with a simple star tip on an icing bag and several colors of frosting. 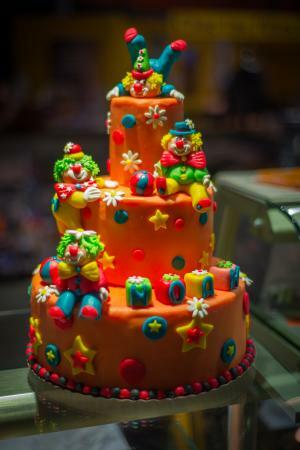 A plain sheet cake can be decorated with clown figures, small toy balloons, or plastic animal toys bought at the toy store or online. Cupcakes can be topped with fondant clown faces in bright colors. Circus-themed sweet treats are wonderful for kids and adults alike who are looking for fun clowns and circus animals to join them at their party. Enjoy the fun and laughter that comes with the circus at your own event.